How do we achieve excellence? We understand what to do and who to engage and we commit ourselves to doing it better than the last time. High-performing Extension professionals also understand the value of collaboration and the critical role that working with others plays in the pursuit of excellence. Whether formally or informally, when we take the opportunity to recognize excellence, it can be multiplied. 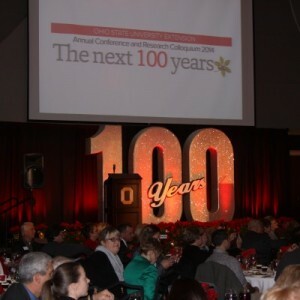 In addition to being a fantastic 100th anniversary party, the 2014 Extension Annual Conference enabled us to cultivate continued excellence when dozens of Extension professionals were recognized for their accomplishments. There were a number of CD professionals recognized at the event as well, including our 2014 Excellence in Community Development awardee (Nancy Bowen) and our 2014 Friend of CD awardee (Ohio Federation of Soil and Water Conservation Districts), a collaborator in programmatic excellence since 2008. Click here to read more about the 2014 Friend of CD and Excellence in Community Development awardees, as well as a number of other CD professionals recognized for excellence.